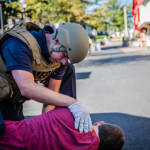 First responders face increasingly dangerous situations when they respond to calls in today’s world of growing violence. 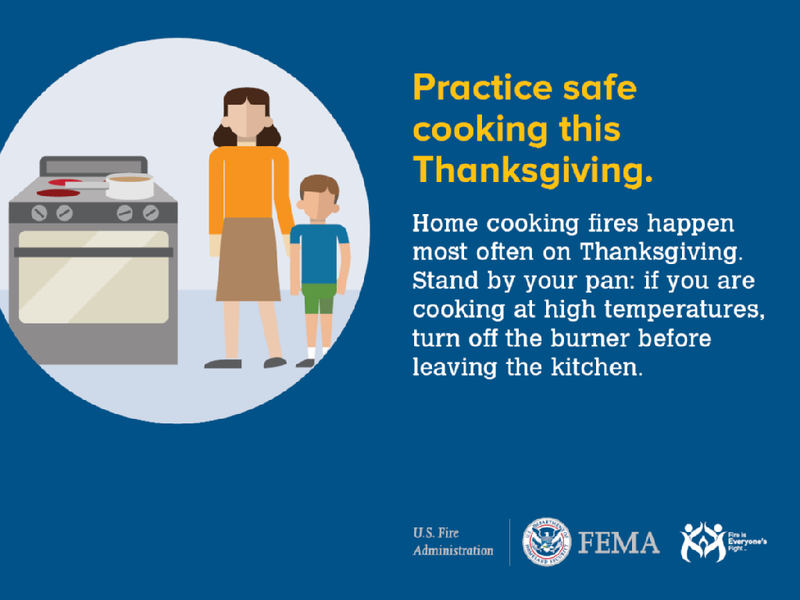 It is important that they be kept informed of emerging trends and hazardous situations they may encounter. Many incidents grow beyond the capacity of a single agency or municipality. It is therefore beneficial for first responders to establish relationships with responders from surrounding municipalities and from as many disciplines as possible. 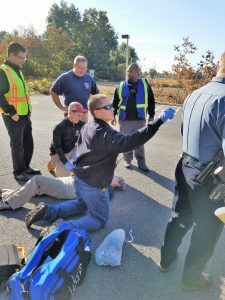 The Western Region Homeland Security Advisory Council (WRHSAC) provides responders with cutting edge trainings which increase responder knowledge and capabilities. 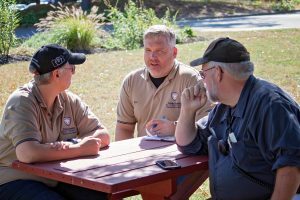 The trainings bring together multiple disciplines from throughout western Massachusetts, fostering relationships that can be key elements to effective and timely response to emergency incidents. Personnel from local agencies train beside those from state and federal agencies benefiting all with shared knowledge of response capacities and interagency relationships. 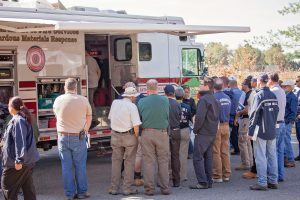 WRHSAC also funds trainings for several specialized teams, such as the Western Massachusetts Technical Rescue Team, the Hazardous Materials Response Teams, Northwest Massachusetts Incident Management Team, and the newly formed Franklin County Special Response Team. WRHSAC will continue to focus on providing quality trainings throughout the coming year. Trainings will address topics such as: command and control, communications, search & rescue operations, mass care services and more. WRHSAC will distribute information about upcoming trainings to first responders throughout western Massachusetts. Additionally, interested parties can monitor the Council’s website and Facebook page, for training announcements. Exercise – A medic assesses a shooting victim. 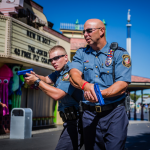 Exercise – Law enforcement responds to shooting incident. 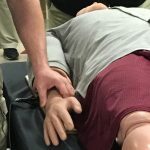 Training – Checking the pulse on a training mannequin. 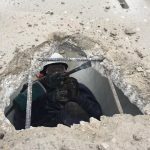 A member of the tech rescue teams practices breaking through a concrete wall. 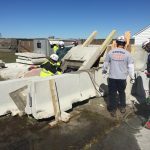 Members of the Western Massachusetts Technical Rescue Team learn how to rescue victims caught within a collapsed building. 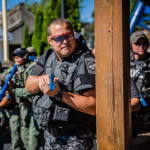 Exercise – Tactical team members search for shooter. As it turns out, the rumors we kept hearing were true! We received official notice that the Fundware accounting software used by the FRCOG and by the regional Town Accounting Program will no longer be maintained or supported by its parent company, Blackbaud, beyond December 31, 2017. Staff are actively examining options for a post-Fundware operation, including searching for grant funds to pay transition costs, and considering opportunities for additional electronic efficiency improvements to modernize the Program. To date, Accounting Program staff have viewed demonstrations of four different accounting software programs and are evaluating each in relation to the accounting needs of the Program member towns. Throughout the process we are searching for software that is easy to use, improves staff efficiency while using the software, and continues to allow member towns with populations under 2,000 residents to benefit from the software without needing to purchase their own expensive software licenses. With Fundware, all towns are able to participate in the Program under the umbrella of the FRCOG’s master license. FRCOG has applied for state grant funding to purchase accounting and cash management software to be used for the benefit of all Program towns. Individual software licenses can be prohibitively expensive for small town budgets. Grant funding will help us modernize our accounting software and add cash management software that will help streamline the cash reconciliation process by more quickly and accurately sharing data between the town treasurer and the accountant. Additionally, the grant application requests funding for consulting assistance to help develop and implement additional electronic efficiencies that will allow the Program to evolve into a more efficient centrally-located operation. More robust software should offer the opportunity to improve efficiencies and help modernize the Program’s operation so we can spend less time traveling and more time doing accounting work for our towns. We should hear whether or not we will receive the grant before the end of December, 2016. Registration is now opened for a new webinar developed by DelValle How to Start a Respiratory Protection Program to be delivered on Wednesday, December 14, 2016 at 11:00am-12:00pm. The target audience for this webinar includes Healthcare Facilities, Emergency Medical Services, Public Health. The registration link for the webinar is: https://delvalle.bphc.org/rpp_webinar. Registration instructions are below. Visit the DelValle Institute Learning Center at https://delvalle.bphc.org/rpp_webinar Select the “Login to Register” button and enter your credentials. You will be redirected back to the course page. Next, select the “Register Now” button and fill-out the registration form to complete your registration. Proceed to create a new account by entering your email address and creating a password with at least 6 characters and at least 1 non-alphanumeric number (e.g. jsmith123!). Fill-in all required fields and select “create my new account”. Follow the next step as instructed by the system. Select the “Login in to Register” button and enter your credentials. You will be redirected back to the course page. Firefighters treat an unconscious victim of a spill of an unidentified liquid. and track resources according to their respective regional hazardous materials emergency response plans, establish communications between agencies and communities, protect the crime scene, evaluate evacuation options and methods to notify residents of the evacuation, and determine how to handle the press all while dealing with a constantly changing direction of the wind. Experienced fire chiefs mentored their captains and lieutenants as they navigated not only the hazmat incident, but also being in command of their peers. Participants get a tour of the regional hazmat team vehicle. The after action report indicates a few areas where the two counties could improve their response capabilities through training opportunities, such as how to use the Emergency Response Guidebook, higher level incident command system and officer training, how to write and follow a communications plan, and how to handle press inquiries. 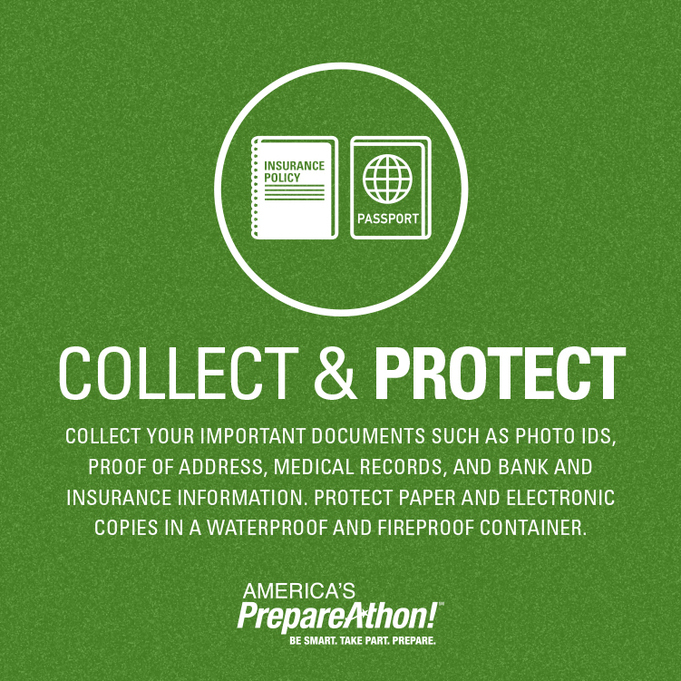 It also lists several strengths, including sizing up a hazmat scene, protecting the integrity of the scene, and leveraging many forms of communication to notify residents of the need to evacuate. Staff from the FRCOG consult with the co-chair of the Hampshire County REPC on how the exercise is progressing. This was the first joint effort between the two REPCs and is likely to inspire future efforts together to get us more bang for our buck. Interested in what is going on at the FRCOG? Check out the updates provided at our most recent Council meeting! The East County Transit Study examined the feasibility of initiating fixed route transit service to the East County region, which includes the communities of Leverett, New Salem, Shutesbury, and Wendell. Currently, there is no fixed route transit service to or from this area of the county, nor are there connections to other transit routes or providers. A survey was conducted of all households in the four-town area, with a very strong response rate. While it does appear that there is potential demand for a form of transit service, current funding levels do not support start-up at this time.